Fantastic card and I like the addition of the coffee cup. Love your card. 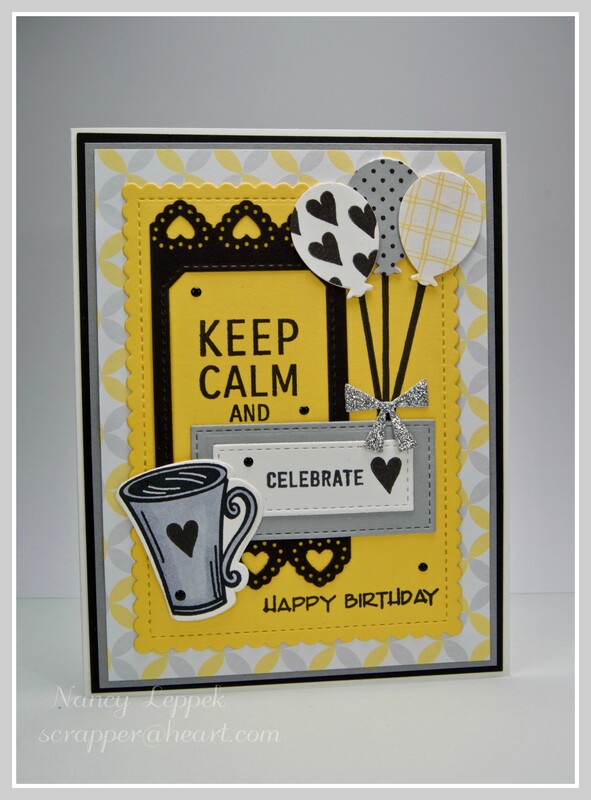 Great color combo and pretty design with those balloons, cup and black frame. NIce bright colors and i love all of the dies that you added here. Yellow, black and gray really makes a great color combo. Nancy, I am so impressed at how much use you’ve made from this awesome stamp set! I love each and every one of your creations with it, each so different and wonderful! Love the colour combo! I think you’ve just looked at it too long, because to me it’s an awesome card! I love the gray, black, yellow & white combo. Get subject matter too….such a fun card! I dunno..wouldn’t the coffee make you hyper instead of calm? Anyway, I guess birthdays can be celebrated in both ways! 😛 Wonderful card, Nancy! Love the color scheme and that gorgeous coffee cup! What a chic birthday card Nancy!!! The layout, the placement of the dies and colors are perfect! I love this! Bold, fun and fabulous! Love all the little details and those balloons are amazing.